Is there strength in numbers? Recently I've been thinking about and listening to others discuss what it would take for an author to "make" the New York Times Best Sellers List! Not satisfied with "just the facts", I decided I would not be satisfied until I spent sometime researching and analyzing the isssue. · The NY Times Best Seller list is widely considered the preeminent list of best-selling books in the United States, and is based on the weekly sales of independent and chain bookstores and wholesalers throughout the U.S.; sales at stores like Wal-Mart and Target are not included. · A book that never makes the list can actually outsell books on the best-seller list because the best-seller list reflects sales in a given week, not total sales. Thus one book may sell heavily in a given week, making the list, while another may sell at a slower pace, never making the list, but selling more copies over time. · Generally, a book must sell a minimum of 5,000 print copies in a week to make the print list and between 10,000 and 15,000 to make the eBook list. · African Americans represent 13% of the U.S. population. Given this statistic, it should not come as a shock that it’s therefore much harder for African American authors to win a spot on the NY Times and USA Today bestseller lists than for Caucasian authors. She didn’t go into detail about what she believed her readers did – but I’m going to guess they did little more than buy her book because it isn’t hard to sell enough books to reach best selling status when you have a solid following among your target audience – which for her is other Caucasians, or 70% of the U.S. population. Further research revealed an article on a report recently released by PRRI (Public Religion Research Institute): “… the average black person’s friend network is eight percent white, but the average white person’s network is only one percent black. To put it another way: Blacks have ten times as many black friends as white friends. But white Americans have an astonishing 91 times as many white friends as black friends…. There are a number of factors driving these numbers….Simple population counts are one of them”. All of this information brought out in me a new appreciation for literary events, award shows and best selling lists run by African American literary organizations to give our authors their much-deserved recognition. In fact it reminded me of need for the many African Americans organizations that have been founded to give people of color a voice, such as the National Medical Association founded by and for physicians of color before they were permitted to join, the then all-white, American Medical Association, and that's why "Black Girls Rock"! 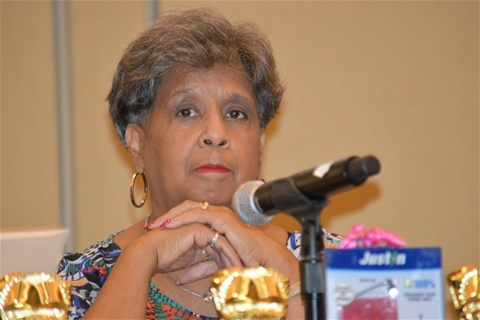 · What can individual readers and book clubs do to help African American authors become more visible in the publishing community? · How can we make bookstores and other retailers aware that we want to see more books about us on their shelves? · What steps can we readers take to help our authors become household names outside of our community? · Stop “book” sharing! Every time you loan a book to someone, you rob the author of a sale and a chance to become more widely known and appreciated. · Review what you read! If a book is well reviewed it can prompt publishers to invest more money into promoting and advertising for an author and booksellers to increase orders and give the book better display. When you finish a book, take the time to post a review on Amazon, etc. It doesn’t have to be long – just a few sentences explaining why you did or did not like the book and whether you would or would not recommend it to others. · Step out of your comfort zone! We all love our Kindles, I-pads, etc. but sometimes we might have to step out of our comfort zone to buy and encourage others to buy print books to impact first week sales. · Give books as gifts and not just for Christmas! When shopping, buy an extra book and give it to a friend who is of a different ethnic group to introduce them to an African American author and help stimulate “cross over” sales for our authors. If you don’t have a Caucasian friend, leave the book at the doctors’ of dentists’ office, or on the subway or bus. Someone will pick it up. · Ask for what you want! Don’t settle for books that you would like to read not being in your local book or retail store or public library. Ask the manager to stock them, ask your friends and co-workers to make similar requests and then buy the book when it appears! · Support authors in their first week of sales! Don’t just support those you know and often read – but also support new or emerging authors that you haven’t read before. · Stay abreast of what is trending! Join Facebook groups and author fan pages, author and reviewer blog pages, on-line magazines, blog radio shows, etc., to find out what people are reading and recommending.